Magnesium (Mg) alloys are receiving increasing attention due to their abundance, light weight, castability, formability, mechanical properties and corrosion performance. By selecting the appropriate combination of materials, coatings and surface modifications, their corrosion resistance can be greatly enhanced. Corrosion prevention of magnesium alloys is a comprehensive guide to the effective prevention of corrosion in these important light metals. Part one discusses alloying, inhibition and prevention strategies for magnesium alloys as well as corrosion and prevention principles. Part two reviews surface treatment and conversion. Beginning with an overview of surface cleaning and pre-conditioning, the book goes on to discuss the use of surface processing and alloying, laser treatments, chemical conversion and electrochemical anodization to improve the corrosion resistance of magnesium alloys. Coatings are then the focus of part three, including varied plating techniques, cold spray coatings, gel and electroless electrophoresis coatings. Finally, the book concludes in part four with a selection of case studies investigating the application of preventative techniques for both automotive and medical applications. 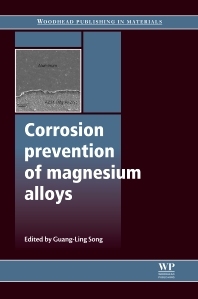 With its distinguished editor and international team of expert contributors, Corrosion prevention of magnesium alloys is a key reference tool for all those working with magnesium and its alloys, including scientists, engineers, metallurgists, aerospace and automotive professionals, and academics interested in this field. Guang-Ling Song is currently a Research Scientist in ORNL National Lab, USA after 5 years working for General Motors Global Research and Development. He is also an Adjunct Professor at the University of Queensland, Australia, known internationally for his research in the field of corrosion and corrosion protection.